A gift pack containing Stahly's Scotch Haggis, tinned turnip and instant potato. A complete Burns Night Supper. The perfect gift for a Scot far from home. Stahly Haggis is made in Scotland and canned ‘whole’ within a synthetic skin. 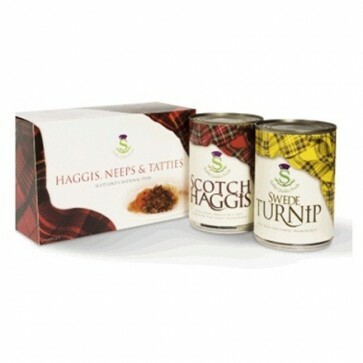 Perfect to send overseas as the canning process means it looks like traditional haggis and has the convenience of a long shelf life, there is no need for refrigeration and it is easy deliver by post. This gift pack will serve 1 to 2 people as a main meal. Easily prepared in the oven in 30 minutes or in a microwave in 4 minutes, recommended cooking times and instructions are provided on the tin. Care should be taken when piercing the haggis skin.